Tess was offended that I would even talk about her size on my blog. She pointed out that she didn't blog about my size. She has a point there. I risked having her avoid me. I offended her and now I can't get anywhere near her. Uh- Nobody can. Tess is the most skiddish of our sheep. She has no need for humans, so having her ignore me or run away from me means "business as usual". Tess delivered one tiny baby on February 4th. I had two people who had the date right, but she fooled all of us by having only one. She looks like she's hiding several. Let me show you the baby. The lamb has a patch around each eye. Everyone else was anxious to see the newcomer. This is the first mama, twins, and dad. The twins bounce everywhere, with their feet seldom touching the ground. We joke that they just walk on air. I know this photo is ridiculously out of focus, but you can still see how they run above the ground. They move very fast, but mom kind of moseys around. The blur is courtesy of my point and shoot camera. When I borrow a DSLR camera from one of my two photographer daughters, I end up taking a gazillion pictures . I'm so used to taking lots of shots to get one good one, that their fancy cameras make it even easier to fill a media card. Sorry girls. Can I use your camera again soon? Pleeeeeez? So sweet! I love the coloring also. Oh I love Tess's fancy coated little darlin' You look like you are having a good time with babies I love that. Fancy cameras are nice they will let you borrow it I am sure. But I think your photos are great. I love it. The little lamb is precious. Looks like it could be a contender for a mascot for a rural fire department! Tess's daughter (or is it a son?) is incredibly cute! One time Mr. Dreamy & I watched lamb jumping beans for at least an hour. They were so funny. I love the way they move....walking one minute and then bounding into the air as if bitten by a flea. Only ewe knew.... hahah. Congratulations. The lamb is real cute. Sweet little lamb! Very interesting coloring with the eye patch. A gorgeous lamb! So are the others. I really did think she was carrying twins, she was so big! Sorry, Tess. No offense intended. The baby is so adorable! that is a sweet baby! 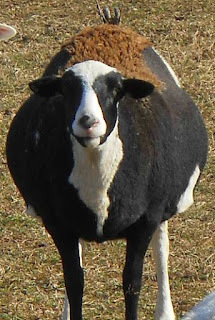 Oh, my, I don't know much about sheep, but that is the most gorgeous baby!!! Oh, that baby is SO sweet! Oh, all your sheep are so precious. Ms. Tess sure looked like she was carrying more than one....of course, so did I when I was preggo with our 8 lb 1 oz daughter!!! ;-) And, I so want a DSLR camera!!! What a beautiful baby. I just love baby animals. Wow!! Tess sure has a WIDE LOAD in the first picture. Awww, what a sweet baby. I love the coloring too. What a cutie! Congratulations and have a great weekend! What a little sweetie pie and those colorings are awesome! Just popped by to say Hi back... we are now all dug out of the snow and the sun even came out late afternoon. Can you believe on Monday it is supposed to be 40 and rain?! Geez Louise! LOL! Hugs and enjoy the rest of your weekend! From the photo, it looked like twins, if not triplets; that was a surprise!